Where seen? This endangered tree is rarely seen in our mangroves. According to Ng, it was only seen at Pasir Ris Park, Pulau Tekong, Pulau Unum; individuals formerly recorded at Sungei Changi seem to have died out. According to Davison, it is found on Pulau Tekong, Sungei Buloh, Pasir Ris Park and the Western Catchment. It is also found on Pulau Ubin and Chek Jawa. According to Hsuan Keng, it was found in Jurong and Ulu Pandan. Features: From a slender shrub to small tree up to 5m, sometimes to 24m, in Singapore to about 15m tall. Bark grey fissured and slightly flanged base. Knee roots may be up to 30cm tall. 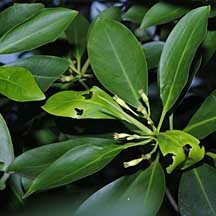 Leaves eye-shaped (7-13cm) light green with slender petioles, arranged opposite one another. Stipules are light green. Flowers appear in groups of 2-5 per leaf angle. The calyx is a slender tube (1cm long) with 8 tiny short lobes. Tiny petals yellowish-green tipped with 3 tassels. 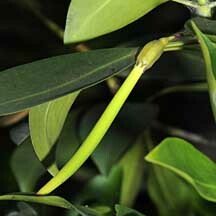 Propagule develops on the parent plant: thin, smooth and long hypocotyl (8-13cm long) slightly curved, and the calyx lobes clasping the propagule (not bent towards the stalk). According to Tomlinson, the small flowers are pollinated by day flying insects such as butterflies. 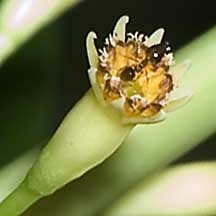 The petals of the flower hold loose pollen and are under tension. When probed at the base, the petal unzips to scatter a cloud of pollen over the head of the visiting insect. According to Tomlinson, it is found in inner mangrove fringes and river banks and has characteristics of a pioneer species. According to Giersen, it forms single species stands in areas that are infrequently inundated, while isolated individuals may occur along tidal waterways and coastal fish ponds. Often found in solid stands in the interior of mangroves on firm mud flats. The hypocotyls establish themselves better in areas with much or moderate sunlight. It can be common in overlogged areas or where immature mangrove vegetation is exploited. 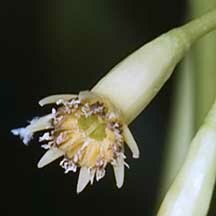 According to Ng, it is found on the inner side of the mangrove and noted to be a slow grower and has the shortest lifespan. It does not appear to grow well in Singapore with only few individuals and less than the 24 m maximum height found elsewhere. Human uses: According to Giersen, the heavy to very heavy timber is hard and strong, and easily worked and finishes well. But it is perishable when exposed or in contact with the ground, and often found in small size. It produces good charcoal, firewood and pulp. The germinating seedling is sometimes eaten as a vegetable. Status and threats: This plant is listed as 'Endangered' on the Red List of threatened plants of Singapore. It is threatened by habitat degradation. Long narrow flowers, several on one stalk. Lenggadai (Bruguiera parviflora) Ng, Peter K. L. & N. Sivasothi, 1999. A Guide to the Mangroves of Singapore I (Plant Diversity). Singapore Science Centre. 168 pp. Bruguiera parviflora on the NParks Flora and Fauna website: photos and fact sheet. Bruguiera parviflora on the IUCN Red list website: detailed fact sheet.